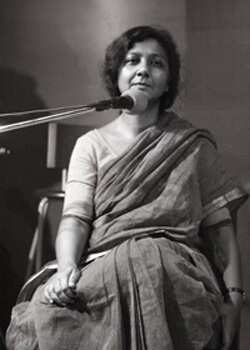 Singer-songwriter-composer Moushumi Bhowmik’s splendid online archive of music can be accessed at Travelling Archive , a remarkable virtual archive of the folk music of Bengal. The neat, minimal site design and simple interface reflects meticulous planning with an eye for detail, and provides access to music that has been painstakingly researched and collected by Bhowmik and recording engineer Sukanta Majumdar. This is work that could not have been achieved in a flash, so it isn’t surprising to find that Bhowmik and Majumdar have been collecting and recording from 2003, and are now set to share a collection of almost 180 hours of music and interviews recorded over 97 sessions. The smart search capabilities offered by the website permit visitors to browse the collections under three fields, namely: Artiste or Composer; Form, for example, Bangla qawwali, kirtan, etc. ; Region, for example, Dhaka, Goalpara, Sylhet, Kolkata, etc. Once a track has been selected for listening in audio format or viewing in video format, information about the track can be accessed easily. Other than providing track details (like duration, form, region), lyrics and notations can also be accessed, as can notes on the recording session during which the selected track was recorded. Location maps and photographs taken during the session add value to the details. This is in such strikingly pleasant contrast to the many important archives and music collections in the country that are often chained to decaying and lethargic state-controlled organizations, or to individual collectors whose sole purpose in life is to ensure that no one gets to hear even a squeak, leave alone a full track. Alas, there are many collectors in the country who have still not found the time or the inclination to catalogue their collections and make the catalogues available online. How then can they hope to attract visitors, students and researchers? Bhowmik and Majumdar also provide a special section on their site dedicated to related research work. There is some fascinating material in this section, including film footage and audio recordings from Bengal made by the Dutch ethnomusicologist Arnold Bake (Music Matters, 18 September 2010, at (www.livemint.com/westmusic.htm) as far back as 1932 and 1933. A discussion forum provides an interactive space for members to discuss, argue and debate if need be. Although there is enough information and music on the site already for the dedicated visitor to spend many happy hours browsing, reading and listening, the Travelling Archive is an ongoing project, and will, therefore, constantly enrich itself and add to its resources. Meanwhile, the website offers so much that music teachers and students can put to good use, provided they have the will to discover the many delights it offers.